I'm back to work on my Grand Slam rustbucket project, and seem to have the election issues mostly figured out. 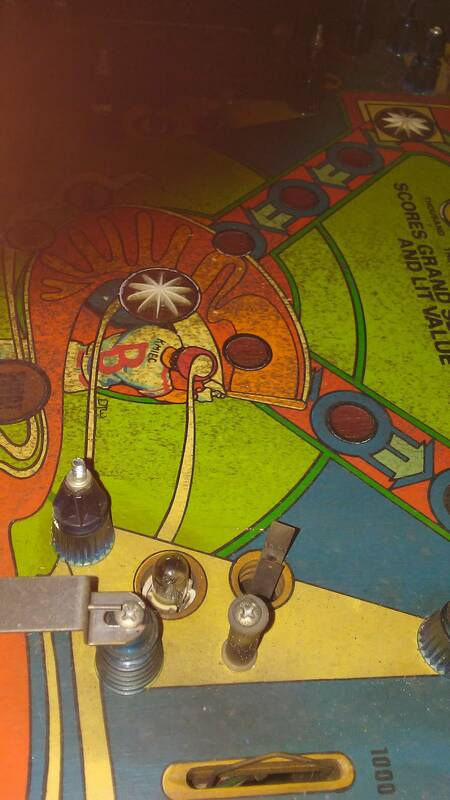 However, I'm struggling to get this playfield clean. These blacks marks haven't come off with Naptha or Novus stage 2. 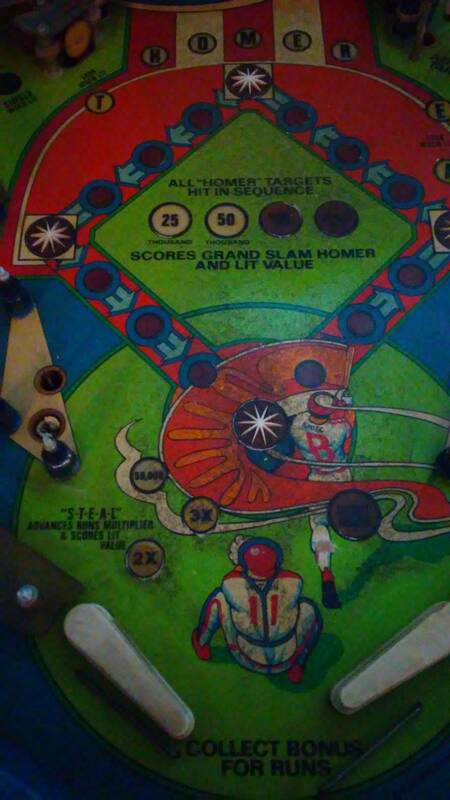 Any suggestions for what might get this playfield cleaned up? Those pics don't enlarge enough to see the surface detail. Sorry about that; I've added a few more pictures, that hopefully give better information. I'm really not sure what it is, which is a big part of why I'm struggling to figure out how to deal with it. Under the apron, try alcohol and magic eraser. 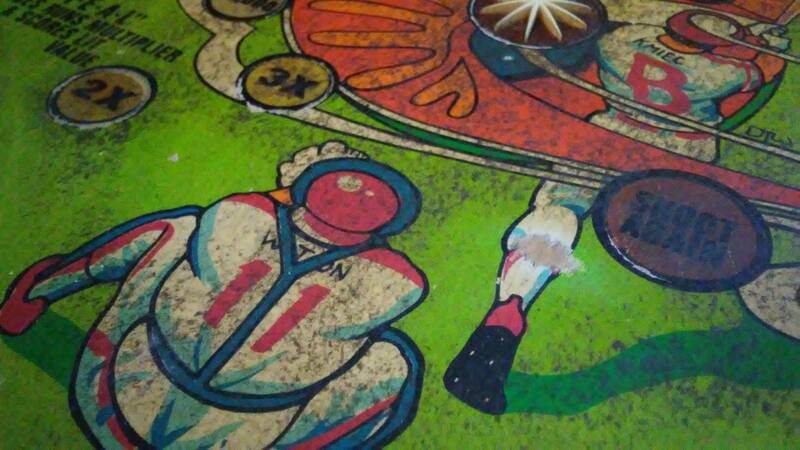 It's all over the heavy traffic parts of the playfield, but not the mylar areas. I'm sad to say, that seems feasible given the amount of water this game was subjected to. In your experience is it feasible that would happen only in high-traffic areas? The Mylar probably protected the lacquer from any mildew attacking it. Is there any mildew under the plastics? Not sure if this helps, but this is what I see under the right sling before attempting to clean. I cleaned under the left sling, and the lacquer is plenty yellowed, but I don't know that I necessarily see mildew there. I'm wondering if the lacquer finish has more cracks in the high-traffic areas that let the milder get down into the paint/wood. Just looked at the plastics which I pulled off the game a while back; they definitely have mildew on the top of them. I'm with Vid1900. That looks like mold or mildew. 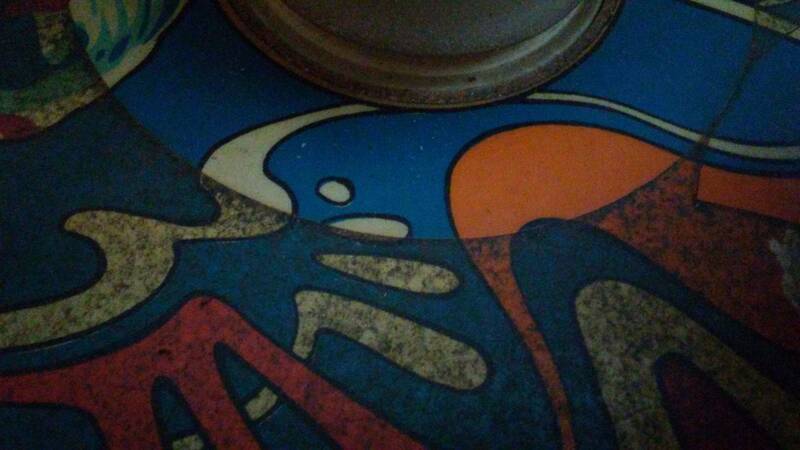 That has attached to the ball swirls. The tops of the flippers are also effected. Thanks for the feedback. Working with the conclusion that it's mildew, what are my options? 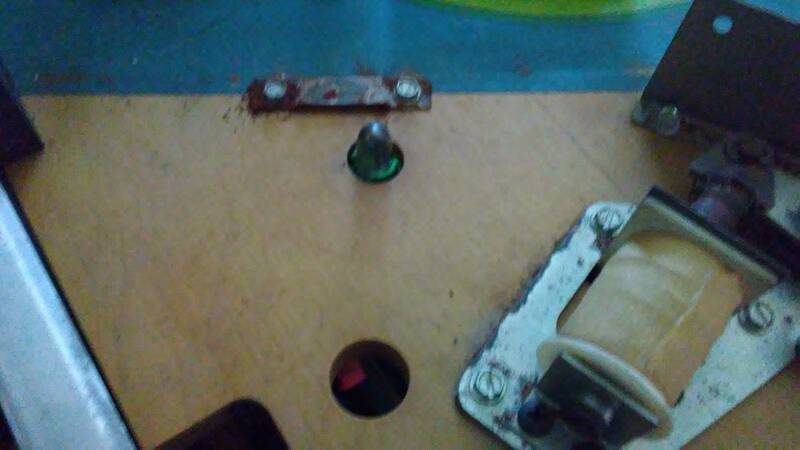 Off the cuff, I can only think to either part it out (which is what I hoped to avoid by buying it,) look for another playfield, or just finish shopping it out and play it knowing I'm stuck with an ugly playfield. I'm assuming the mildew likely goes through to the wood, right? i.e. with magic eraser and alcohol, I'd likely be unable to get the mildew off without taking substantial paint? Depends if the paint binder is edible by the mildew. Try the magic eraser/alcohol in an out of the way spot and see what happens. I'd be inclined to say try a bit of tilex or bleache-white on a q-tip in an inconspicuous area to test for color fastness. If that is mold/mildew, I really can't think of any other way to remove it. There is a product called MoldEx, although it is water based. As a last resort it will kill the mildew. ["Do not use laundry bleach"]. I tried that, and it's definitely removing the mildew with only a couple quick wipes! 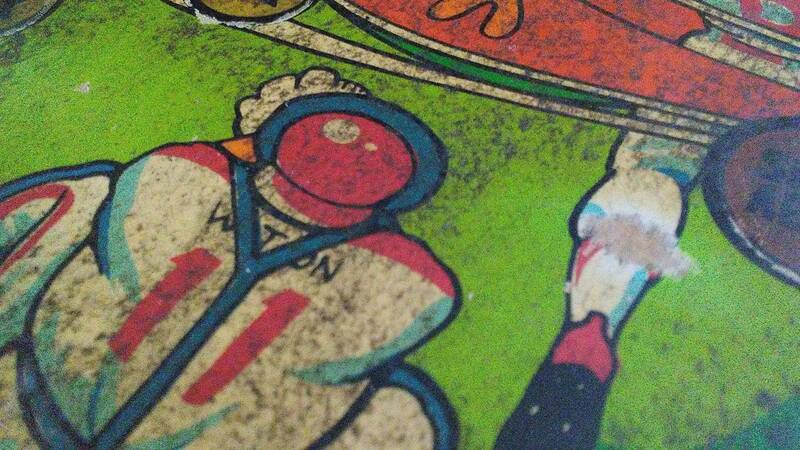 I'm getting a bit of yellow on the magic eraser, which means I'm cutting some of the lacquer off, right? 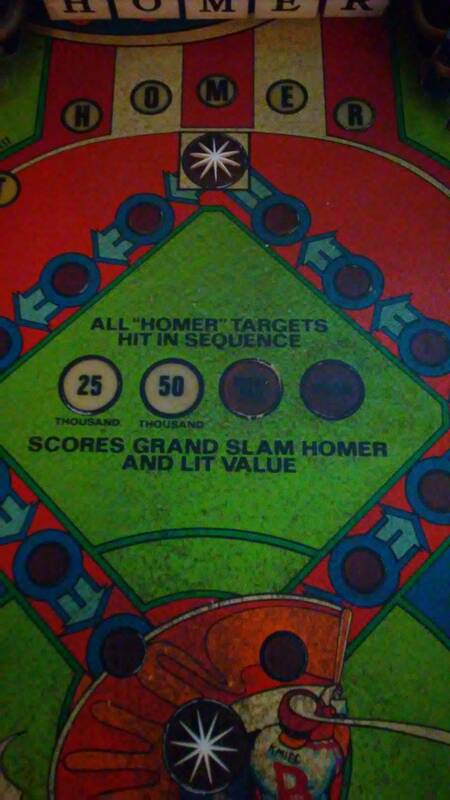 Depends on how much wear is already on the playfield. A new clearcoat would be the best, but clean it up and see where you are at. Yep, a lot of the times in sunlight it looks almost orange. Okay, so I tried the alcohol and magic eraser in a couple little spots, and think I wiped up a fair bit of the residue with a paper towel. Around the edges of where I was working, there's a bit of a white, kinda chalk-y looking haze. I take it that means I'm doing something wrong? It's the magic eraser residue. 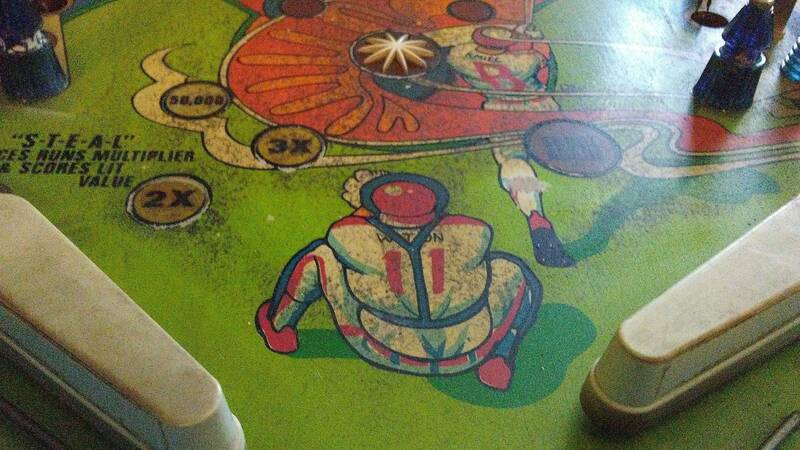 Keep wiping it up while it's still wet, don't let that crap dry on the playfield. Around the edges of where I was working, there's a bit of a white, kinda chalk-y looking haze. I take it that means I'm doing something wrong? The magic eraser actually gets slowly used up, just like a pencil eraser. The white residue is awful to clean-up, it always seems to haze on me in bad spots, normally when I put on too much alcohol and the liquid gets away from me. It is the main reason I almost never use a magic eraser, I only use it as a last resort on a playfield that nothing else will work on. Magic Erasers are just melamine foam, I am not aware of them having any soap product in them. Do a search for melamine foam to get a better idea of the products history. My memory is that they work just like a pencil eraser, by mechanically removing material while the foam is also consumed/covered by the material that is being removed. They are basically a 2000 grit sand paper equivalent. I was always told the white was lacquer that you had removed and that is why it hardens when it dries. I do not end up with the white residue when I use it on my counter tops or walls after my kids draw with a crayon.